December has arrived, and just as winter begins to send chills up our collective spines, I can think of no finer time than to discuss some monsters with you. Cartoon monsters, to be exact. My Favorite Cartoon Monsters: Part 1 is my latest article for my chums over at Dread Central, and I cover some characters that'll surely bring back memories for you. Monsters from G.I. Joe: A Real American Hero, Scooby-Doo, Where Are You!, Looney Tunes, and more are covered in this first piece. 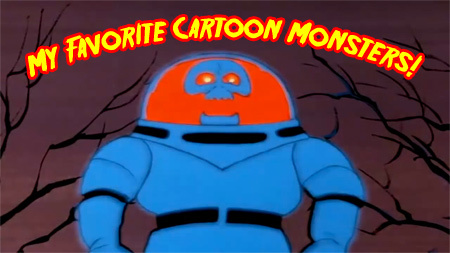 As always, thanks for reading, and please do me a solid by posting in the comments section of the article on Dread Central and sharing what other cartoon monsters you'd like to see me cover in future installments. More fun coming soon! Happy December, everyone! Kinda random, but any discussion of monsters is always a good time. I was always partial to the Sludge Monster from Garfield and Friends. He had a great spooky theme song, and for some reason, big full lips. Not really what you'd expect. The Giant Radioactive Mutant Guppies were good too. Kinda weird how well that show expanded on a comic about a cat being lazy. I agree with ColdFusion, the Sludge from Garfield was terrific. Duckula was one of my favorite shows, I can hear the theme song even now. the looney tunes episode where Tweety bird transformed into a giant monster and tried to eat Silvester? that was scary. the headless one from that episode from that Plantation mansion. The creepy clown with his Hypnotic powers. The Giant Owl ghost spirit thing. that dead old green glowing diving suit ghost who was stealing boats. actually, they were all pretty scary now that I think about it, they had some legitimately scary concepts and designs for them. Scooby-Doo also has some amazing movies that were quite well done, some newer ones even had real monsters like "Zombie Island"
You should cover the 13 ghosts of Scooby-Doo, its so very 80s, so very Vincent Price, and so very scary. The Mask cartoon also had some pretty scary moments from the weirdos that populated it. I'll think of some more later, I'll have to re-watch some collections and clips, see if I forgot some pretty scary ones. I remember when Porky Pig (in a Duck Dodgers episode) chased after Gossamer with a pair of clippers all the while telling him to calm down while he gave him a trim. Off camera you hear Gossamer grunting and shrieking and then Porky returns on camera with a pair of sneakers describing how Gossamer was basically just hair and sneakers. Funny stuff. I loved Duck Dodgers, it was such a fantastic show, great soundtrack too. Speaking of Porky Pig, that reminds me of, I think 2 or 3 episodes, of the old loony tunes cartoons, where Porky along with I think a dog, and Silvester the cat were going on vacation, and he was tired driving so he stopped at this old hotel, there was an infestation of evil mice that tried to flat out KILL him, and the poor cat tried to save him getting injured in the process. I always thought those were pretty scary cartoons because of how blunt the attempted MURDER was. I'm also thinking about the old Popeye cartoons, where he and olive and the fat dude got caught by a bunch of ghost pirates. For some reason the animation was really creepy in that one. Previous post: Our New “Pixels Under The Sea” Pixel Posters Finally Arrived! Order Now! Next post: Abobo & Angry Video Game Nerd!